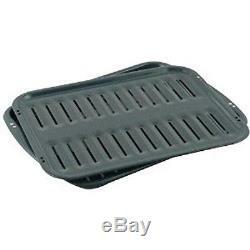 Jenn Air Range Broil Pan Replacement Stove Oven Broiler Pan Grid Tray 4396923RW. Replacement universal broiling tray made to fit a variety of makes and models of stoves, ovens, and ranges. This broil pan set is made to fit Jenn Air range and oven models including the model numbers listed below. Designed to drain juices away from your food and also prevent splatter and smoke. Includes the porcelain coated broiler pan and tray. If your Jenn Air range or oven is not listed, use part numbers and dimensions to determine if this broiler pan and grid tray will fit your Jenn Air oven or range. Replacement broil pan measures 1 1/2" x 12 1/2" x 16 1/2. Replaces part numbers: 4396923, 4396923RW, 8189635, 0314175, 0308139, 0308138, 0304451, 0098682, 0095943, 0091434, 0090001, 0089653, 0089120, 0089119, 0089096, 0088771, 0088689, 0088688, 0088555, 0088302, 0088301, 0087940, 0087723, 0087722, 0047954, 0047952, 0047949, 0047948, 0045107, 0045102, 0042709, 0042701, 0042173, 0042172, 0040626, 0040625, 0040623, 0040622, 0040621, 0040618, 0040612, 0040592, 0040589, L31-001, BP4000, 98682K, 98682, 87723CG, 87723, 87722CG, 87722, 314175CG, AP3837379. 629.21138 629.21138 629.46965 629.46965 629.46969 629.46969 2255 2255 4855 4860 4870 4875 4890 20135 20236 20237 20239 21136 21137 21138 21239 21336 88368 88369 88370 2250ENC 2250ENS 2255ENC 2255ENS 2775ELD D120 D140 D140-C D140-C D146 D146 D146-C D146-C D146W D156 D156 D156B D156W FCE10500A FCE10500B FCE10500W FCE10500WC FCE10501WC FCE10510A FCE10510B FCE10510W FCE10610A FCE10610B FCE10610W FCE10610WC FCE30500A FCE30500B FCE30500W FCE30510A FCE30510B FCE30510W FCE30510WC FCE30600A FCE30600B FCE30600W FCE30610A FCE30610B FCE30610W FCE30610WC FCE30611WC FCE4040B FCE4040W FCE4041B FCE4041W FCE4042B FCE4042W FCE70610A FCE70610B FCE70610W FCG20002A FCG20002W FCG2040B FCG2040W FCG2041B FCG2041W FCG2042B FCG2042W FCG20500A FCG20500B FCG20500W FCG20510A FCG20510B FCG20510W FCG20600A FCG20600B FCG20600W FCG20610A FCG20610B FCG20610W JBQ30BA JBQ30BAM JBQ30L JBQ42BA JBQ42FN JBQ42L JBQ42N JBQ54L JBQ54N JDR8880RDB JDR8880RDS JDR8880RDW JER8785RAB JER8785RAF JER8785RAS JER8885RAB JER8885RAF JER8885RAS JER8885RCB JER8885RCS JER8885RCW JEW8527AAB JEW8527AAW JEW8530AAB JEW8530AAW JEW8530ACB JEW8530ACW JEW8627AAB JEW8627AAW JEW8630AAB JEW8630AAW JEW9527AAB JEW9527AAS JEW9527AAW JEW9530AAB JEW9530AAS JEW9530AAW JEW9530ACB JEW9530ACW JEW9627AAB JEW9627AAS JEW9627AAW JEW9630AAB JEW9630AAS JEW9630AAW JEW9630ACB JEW9630ACW JGR8775RDB JGR8775RDS JGR8775RDW JGR8875RDB JGR8875RDS JGR8875RDW JGR8885RDP JGR8890ADP JGS8750BDB JGS8750BDS JGS8750BDW JGS8850BDB JGS8850BDQ JGS8850BDS JGS8850BDW JGS8860BDP JJW8527AAB JJW8527AAW JJW8530AAB JJW8530AAW JJW8530ACB JJW8530ACW JJW8530BAB JJW8530BAW JJW8530BCB JJW8530BCW JJW8627AAB JJW8627AAW JJW8627BAB JJW8627BAW JJW8630AAB JJW8630AAW JJW8630BAB JJW8630BAW JJW9527AAB JJW9527AAQ JJW9527AAS JJW9527AAW JJW9527BAB JJW9527BAQ JJW9527BAS JJW9527BAW JJW9530AAB JJW9530AAQ JJW9530AAS JJW9530AAW JJW9530ACB JJW9530ACW JJW9530BAB JJW9530BAQ JJW9530BAS JJW9530BAW JJW9530BCB JJW9530BCW JJW9627AAB JJW9627AAQ JJW9627AAS JJW9627AAW JJW9627BAB JJW9627BAQ JJW9627BAS JJW9627BAW JJW9630AAB JJW9630AAQ JJW9630AAS JJW9630AAW JJW9630ACB JJW9630ACW JJW9630BAB JJW9630BAQ JJW9630BAS JJW9630BAW JJW9630BCB JJW9630BCW JMW8527AAB JMW8527AAW JMW8530AAB JMW8530AAW JMW8530BAB JMW8530BAW JMW9527AAB JMW9527AAQ JMW9527AAW JMW9527BAB JMW9527BAQ JMW9527BAW JMW9530AAB JMW9530AAQ JMW9530AAW JMW9530BAB JMW9530BAQ JMW9530BAW PRG3000P PRG3601P PRG4802P S100 S100 S101 S101 S105 S105 S105-C S105-C S110 S110 S120 S120 S120-C S121 S121 S125 S125 S125-C S125-C S136 S136B S136-C S136W S136W-C S156 S156B-C S156-C S156-C S156W S156W-C S160 S160-C S161 S166 S166B-C S166-C S166W S166W-C S176 S176B S176B S176W SCE30500B SCE30500W SCE30600B SCE30600BC SCE30600W SCE30600WC SCE4320B SCE4320W SCE4340B SCE4340B-C SCE4340W SCE4340W-C SCE70600B SCE70600W SEG196 SEG196-C SEG196W SEG196W-C SU110 SU130 SU146 SU146B SVD48600B SVD48600BC SVD48600P SVD48600PC SVD48600PF SVD48600PG SVD48600PK SVD48600PR SVD48600PT SVD48600PU SVD48600W SVD48600WC SVD8310S SVD8310S-C SVD8310SF SVD8310SG SVD8310SK SVD8310SR SVD8310SU SVE47100BC SVE47100WC SVE47500B SVE47500W SVE47600B SVE47600BC SVE47600W SVE47600WC SVE87600B SVE87600W W104 W105 W105-C W106B W106B-C W106W W106W-C W110 W116 W116 W121 W121-C W121-E W121-E W122 W122-C W122-C W123 W123-C W123-C W130 W130-C W130W W130W-C W136 W136-C W136W W136W-C W141 W141-C W142 W142 W142-C W142-C W146 W146-C W146-C W156 W156B W156B-C W156-C W156-C W156W W156W-C W181 W181 W188 W188W W188W-C W198 W198-C W198W W198W-C W204 W205 W206B W206B-C W206W W206W-C W210 W211 W214 W214 W215 W216 W221 W221-C W224 W225 W227B W227B W227W W227W W230 W231 W236 W236B W236W W241 W2410B W2410B W2410W W2410W W241-C W242 W242 W2450B W2450B W2450W W2450W W2451B W2451W W246 W246-C W246-C W246W W256 W256B W256B-C W256W W256W-C W266 W27100BC W27100WC W27200B W27200BC W27200W W27200WC W2720B W2720B-C W2720W W2720W-C W27400B W27400W W2750B W2750B-C W2750W W2750W-C W276 W276W W2780B W2780B-C W2780W W2780W-C W30100BC W30100WC W30400B W30400BC W30400P W30400PF W30400PG W30400PK W30400PR W30400PU W30400PV W30400W W30400WC WG200 WG206 WM227B WM227W WM236B WM236W WM2720B WM2720W WM27260B WM27260W WM27460B WM27460W WM2750B WM2750W WM277B WM277W WM2780B WM2780W WM30460B WM30460W WMG3020B WMG3020W WW2460B WW2460W WW27210B WW27210P WW27210PF WW27210PG WW27210PK WW27210PR WW27210PU WW27210W WW27430B WW27430BC WW27430P WW27430PF WW27430PG WW27430PK WW27430PR WW27430PU WW27430W WW27430WC WW2750B WW2750W WW2780B WW2780B-C WW2780W WW2780W-C WW30430B WW30430P WW30430PC WW30430PF WW30430PG WW30430PK WW30430PR WW30430PU WW30430W. Thank you for shopping with. We are happy to help in any way we can to provide a positive shopping experience! The item "Jenn Air Range Broil Pan Replacement Stove Oven Broiler Pan Grid Tray 4396923RW" is in sale since Wednesday, May 13, 2015. This item is in the category "Home & Garden\Major Appliances\Ranges & Cooking Appliances\Parts & Accessories". The seller is "yourpartsdirect13" and is located in Lenexa, Kansas. This item can be shipped to United States.